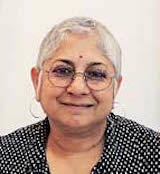 Anita Dube was born in 1958 in Lucknow. In 1979 Anita received her degree in B.A. (History) from University of New Delhi. In 1982 she received her degree in M.F.A. (Art Criticism) from Maharaja Sayajirao University, Baroda. In 1992, 2000, 2003, 2005 and 2015 she had solo shows, New Delhi. In 1999, 2003 - 2007 and 2010 she exhibited solo in Mumbai. In 2005 and 2008 she showcased at Bose Pacia, New York. In 2007 and 2011 she exhibited in Paris. In 2012 and 2013 she exhibited solo in Berlin and Bologna. In 2013 she showcased ‘Offering: Photography works by Anita Dube’ in Focus Photography Festival at Kala Ghoda Association, Mumbai. From 1997 - 2002 she exhibited in various group shows in New Delhi, U.K., Melbourne, Mumbai, New York, Chandigarh, Helsinki, Greenwich, Manchester and Berlin. From 2003 - 2008 she participated in group shows in Oslo, Vancouver, Mumbai, New Delhi, Paris, Lille, Pittsburg, Chicago, Bern, Newark, Milan and Belgium. From 2009 - 2014 she took part in group shows in Berlin, Wein, London, New Delhi, New York, Gurgaon, Mumbai and London. In 2000 she participated in 7th Havana Biennale, Havana, Cuba. In 2001 she took part in Yokohama Biennale, Yokohama. In 2005 she took part in Venice Biennale, Venice. In 2008 and 2009 she participated in ‘Armory Show’, ‘Art Basel’ and FIAC represented at Bose Pacia, New York. In 2008 she participated in the ‘Contemporary Photography and Video Art’ at Minneapolis Institute of Art, USA. In 2009 she participated in ‘Modern India’ in Spain. In 2009 she exhibited in 'The Audience and the Eavesdropper, London and New York. In 2009 she participated in 'Lines of Control' in Dubai, Karachi and London. In 2009 she showcased in London, Beijing, and Seoul. In 2010 she participated in a group show in Brazil, Whitechapel Gallery, London; Fotomuseum Winterthur, Switzerland and Museum of Contemporary Art, Taipei. In 2011 she took part in a group show at Singapore Art Museum, Singapore; Centre Pompidou, Paris; New Delhi, San Francisco; Prague Biennale 5 and Jehangir Art Gallery, Mumbai. In 2012 she exhibited in Biennale Jogja XI at Jogja National Museum, Yogyakarta. She participated in group shows at Museum of Art, Ithaca and Lalit Kala Regional Centre in Chennai. In 2012 and 2013 she participated in Kochi-Muziris Biennale, Kochi. In 2013 she exhibited in group shows at Kiran Nadar Museum of Art and Lalit Kala Akademi, New Delhi.